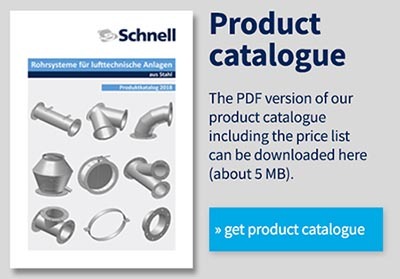 Schnell Rohrleitungsbau - Specialized in tubes, fittings, ductwork and ..
SCHNELL has been active in the field of sheet metal fabrication for more than 80 years. ● Pipework / ductwork for dust-collection, exhausting, hot air, etc. Skilled craftsmanship combined with modern CNC manufacturing technology ensures the high quality of our products. SCHNELL is a certified welding company according to AD 2000-data sheet HP0 and EN ISO 3834-2. Furthermore we have the approval to weld steel structures according to EXC2 – DIN EN 1090-2. Our team consists of about 50 qualified employees working on production and storage facilities of more than 6,000 square meters. SCHNELL is based in Burbach, North Rhine-Westphalia, a centrally located industrial region in Germany, known for steel production and fabrication. Own vehicles and well-networked logistics partners enable just-in-time deliveries nationally and internationally, whether parcel shipping or heavy transport. We are experts in the fabrication of steel and stainless steel – for more than 80 years. While tubes were initially manufactured for agricultural machinery, ductwork for environmental technology has been in the foreground since the 1970s.